Broad Peak, locally called Falchan Kangri, is the world’s twelfth highest mountain at 8,047 meters. It is located along the western Baltoro glacier between K2 and Gasherbrum IV in the Karakoram Range in north-eastern Pakistan. 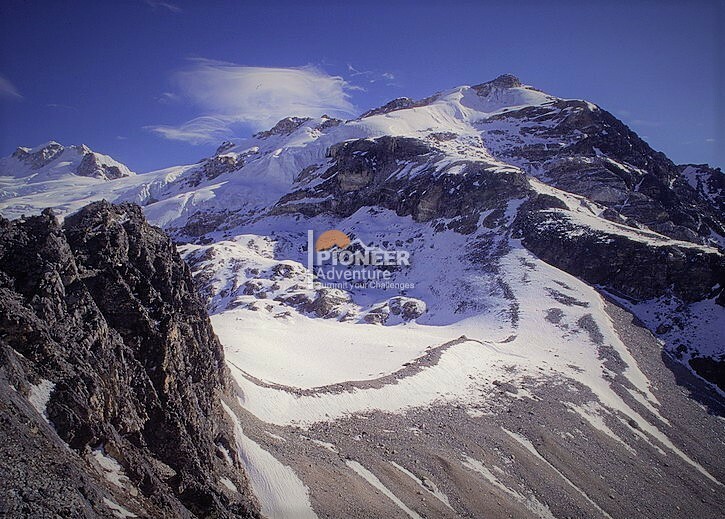 The expedition main route to the summit involves a 3,150 m. ascent from the base camp via the West Spur and North Ridge and this route is moderately strenuous. The summit ridge of the peak is almost 2 km long and therefore, British explorer, W.M. Conway named the mountain ‘Broad Peak’. An Austrian expedition team were the first from Europe to summit this peak in 1957 without porters or supplemental oxygen. Upon arriving in Islamabad, we collect the permits for the peak and fly from Islamabad to Skardu. We also have another option, if the weather is good, we can travel by jeep through the Indus gorge to Askole. In Askole we fix camp out in the wild countryside. From Askole we begin our trek to base camp of Mount Broad Peak and each night we camp out at Jhula, Paiju, Urdukas, Goro II and Concordia Broad peak base camp before we actually ascend and summit to Mount Broad peak. It takes us 6 days to reach the base camp. Balti porters will carry all our camping gear and luggage up the valley towards the stark and barren countryside. From the base camp, the route involves ascent through a rock gully to Camp I (6,000m) and then further up a large snow face until we reach Camp 2 at around 6,400m. A final camp is set up at 7,400m from here we make the summit attempt. The climbing is not that extremely steep but the remoteness of the area will make an especially rewarding experience. Climbing to this remote region will have its own unique experience.